The kitchen is the undeniable hub of the home. It’s where we entertain, lounge, or idle by as our S.O. makes dinner for the night. And with it being a space that holds such importance, it’s crucial that the aesthetic of the room be one that fosters warmth and happiness. Finding ourselves with the constant need for inspiration, we took to Pinterest (plus, a few other close sources) to seek out the kitchens that could double as our dream space. Read on the see the spots we can’t stop pinning, and the lessons we learned from each! Consider this the ultimate incentive for matching your kitchen island to the floors. Set against a serene, whitewashed backdrop, the color-rich depth of the warm wood takes center stage yet not in an entirely overwhelming manner. A handful of industrial elements found by way of the hanging chandelier and sleek fixtures complete the scene. The key to making a dark kitchen work lies within a curated palette and a pared-down approach to the decor. Take decor cues from this mod-meets-rustic spot, where the hunter green hue reserved for the cabinets comes paired with a streamlined, white countertop, bucolic wood flooring, and a handful of earthy elements that seal the deal. It should come as no surprise that Justina Blakeney’s kitchen is replete with as much color and pattern as one would come to expect from the boho-extraordinaire. From the intricately patterned tiles to the rich hues of the backdrop and the oh-so-chic Smeg fridge of a contrasting cool blue, this kitchen is a true lesson in decorating with color. An understated decor scheme doesn’t have to entail a snoozy palette. Bring in an assortment of textiles, greens, and textured materials to lend a defined layer to the space. Styled by Emma Fischer for Bujurfors via My Scandinavian Home. Carly Page‘s teeny tiny kitchen manages to pack in major style thanks to the exotically-sourced runners and bevy of fresh greens. Pink and green make for quite the complementary pair – even when it comes in the form of an untraditional scheme. In this elegantly rustic kitchen, a green subway tile backsplash highlights the saturated wall paint, setting the backdrop for the eclectic decor of the space. Please excuse us while we swoon over every square inch of this stunning kitchen. Leave it to Leanne Ford to serve us up with a whitewashed room that’s anything but boring. Simple light wood details and a Pin-worthy lighting situation instantly elevate this bright and airy room. Black herringbone flooring, steel-paned windows, and the deep teal cabinets complete this utterly dreamy kitchen setting! The abundance of natural light streaming from the room’s multiple light sources extends an ethereal detail to the space. Old meets the new in this dynamic kitchen, situated in Sonoma’s newest scribe winery Patinaed-copper cookware, bold marble counters, and a rustic dash of bold blush on the walls complete the effortlessly chic aesthetic of this stunning spot. Mint green accents, woven pendants, and a total whitewash result in an elegantly simple decor scheme that’s both modern and fresh. 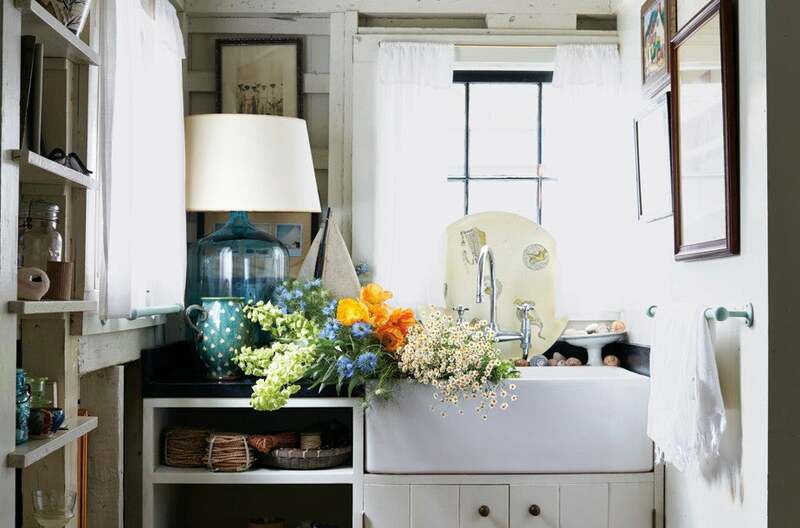 Is there anything more perfect than a kitchen sink filled with flowers? Probably not. Thomas O’Brien’s historic Long Island home effortlessly embodies the charm of a rustic french cottage inspired space, filtered with a hint of casual elegance. A vibrant area rug lends the whitewashed ktichenette with a colorful accent while an eclectic array of woven accents elevate the design. Blush-toned kitchens are having a moment, and this one makes quite the case for implementing the trend into your space. Offset the femininity of the shade with a bold backsplash – much like the one in this ultra chic kitchen – and complement the look with an eclectic slew of found objects and statement-worthy accessories. SALVA LóPEZ FOR MONOCLE MAGAZINE. Whitewashed minimalism never looked so good. With a subtle subway tile backsplash, marble counters, and stone grey tiles, this light-filled kitchen is about as Pinterest-perfect as it gets. We’re simply obsessing over this bright blue chinoiserie print. Not only does it instill a colorful element to the all-white palette, it also imparts the kitchen with a dynamic punch of style. A whitewashed brick surround can balance out the sterility of an exclusively stainless steel setup. Here, stained wooden floors and a bounty of potted greens contribute to the warmed up aesthetic while a pink tiled backsplash lends a subtle pop of color. Moody greens combine with matte black accents and a rustic design aesthetic in this French country-inspired kitchen. Proof that mixing and matching within a moody palette can be done. Bring in an unexpected pop of color to the stark white kitchen, creating a more dynamically defined aesthetic that’s lively and bright. The saturated hue of these leather counter stools provides an effortless complement to the stained wooden flooring, drawing the eye away from the exclusively whitewashed scheme. A defined blue sets the backdrop for this ultra modern kitchen, inviting in a bold color detail that helps elevate the whitewashed decor. A typical kitchen’s access to natural light calls for an equally bold and bright decorative palette. Even if you’re opting for a more saturated wall paint, balance out the look with stark white details and plenty of fresh greens. This dreamy blue spot makes excellent use of the space’s light source. Stools can make or break a kitchen’s aesthetic, so select wisely. Opt for a style that not only complements the kitchen’s decor scheme but also offers a subtle element of contrast as well. Here’s your chance to get creative with color or materials. Balance out the starkness of a monochrome kitchen by bringing in intricate patterns and subtle pops of color. The handful of wooden details in this space do the trick. We’re loving these delicate wood veneer cabinets and the way they impart this modern kitchen with warmth and character. Springing for stained wooden cabinets? Balance out the look with a marble backsplash and a streamlined structure. A hexagonal backsplash steals the spotlight in this ultra white kitchen, where style and character comes in the form of the understated furnishings and the organic greens. For the monochrome-enthusiasts, a stunning space that definitely isn’t holding back on the wow-factor. Featuring a color palette that samples a handful of timeless grays, this kitchen’s spotlight moment just might have to be the beautifully stained dining table. There’s nothing snoozy about an all-white kitchen when you have high-contrast moments and accent pieces that double as show-stoppers in their own right. In this mod Brooklyn home, streamlined details and a reserved palette with vibrant pops of natural color establish a bold dose of character and style. The blue-gray designated for the cabinetry lends an effortless complement to the muted details of this serene kitchen. A dynamic finish comes in the form of the eclectic (yet carefully curated) clusters of decorative accessories.